Evidently I had acquired Base Camp by the time I did this layout since it is what was used for the title. Actually I still remember my first carts. George and Keystone came with my Cricut. I sold Keystone on eBay and then bought Base Camp. A dear friend of mine bought me Opposites Attract and then I got Doodle Charms. I remember thinking I wouldn't need another cart! *okie is amazed at her naivety at times*. 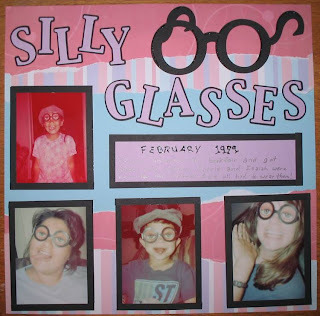 I made the glasses with George and Design Studio. Some of my long time followers will probably remember there was very little that I couldn't make as long as I had that combination! I know you are probably thinking the picture quality is really bad...and it is. There were several years during my daughters life that almost all of my pictures have that great over exposure look to them. There is a very simple reason for that...she would almost always manage to open the camera! THANK GOODNESS FOR DIGITAL! Even though the quality isn't good I am so glad I had these pictures. We had the best time with those silly little glasses that weekend and if I didn't have the pictures I might not even remember! Oh and look how daring I got with the papers this time! Several layers! OHHH MMYY!! *okie falls out of chair laughing*. This one would have been about two months after getting my Cricut. I have some of those same-type overly exposed photos, too! AND for the same reason. But, I still cherish them... and *ugh* myself at what could have been with better techno, but hey! be grateful, right? Awesome layout. Very good, even for a beginning Cricut-Cutter! You've come a LONG way, baby! Ohhhhhhhh ... looks at those goofy eyes!!! =) I'd say this LO looks pretty good, mats, layers, lettering, shadows, and your very own DS/Cricut designed glasses too! And, WHOA, what's that I see ... bling? Guess you discovered stickles a long time ago??? My first carts were very similar to yours ... except that my baby bug only came with George, I never had keystone. Doodlecharm, Jasmine, Paper Pups, Stamped, Base Camp, Tear Drop, All Mixed Up, Mini Monograms ... etc. WOW, back then, who would have ever guessed there would end up being the vast cart selection we have today? I also remember that back in the beginning, we could actually use coupons to purchase our machines, carts, and supplies ... which is a good thing ... because they didn't hit the e-bay market full force too much during that first year! You did a great job on this LO! It doesn't matter how great a picture is as long as we can remember those fun times. I have many pictures that look like this. Thanks for sharing. i love the laout and i love teh story behind the glasses! that is just too cute! i love all your layering otoo! Pictures from the old non-digital camera just make them look vintage. Want a good laugh? Show the kids a rotary phone with a curly cord ;) Mine didn't know what to do with it.